Diapers. They are a way of life for new parents. But how many parents really think about their diapering decision? Chicago mom, Rachel Shaw Callahan, admits she didn’t give it much more than a passing thought when she was pregnant. But in these tough economic times, more budget-strapped parents are considering making the switch to cloth diapers to save money. A recent survey conducted by Harris Interactive for DiaperShops.com, a leading online cloth diapering boutique, found one-third of parents who use disposable diapers say they would be “extremely” or “very likely” to switch to cloth diapers after learning that cloth diapers could save them $2,000 over the course of their baby’s diapering years. However, just because parents say they are willing to switch doesn’t mean many of them have done it. The survey found that only about one in 10 parents with children in diapers use cloth diapers. This number represents a substantial minority of the parenting population. Abosrb-it-all Organic Cotton Diapers available at GreenNest.com. 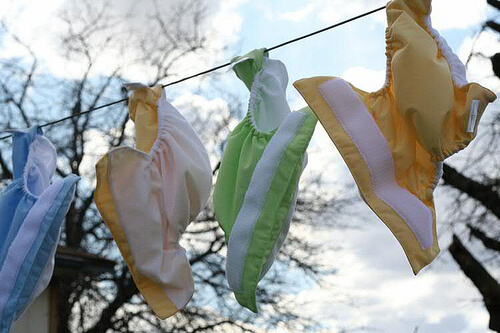 A third of disposable diapering parents say they would be “extremely” or “very likely” to switch to cloth diapers after they learned how disposable diapers negatively impact the environment. Experts say disposable diapers take 250-500 years to decompose in a landfill and more than 27 billion diapers end up in landfills each year. Moms also appear to be more concerned about diaper rash. Almost 30 percent of moms say they would be “extremely” or “very likely” to switch to cloth diapers if it could ease or eliminate diaper rash. Tereson Dupuy, the founder of FuzziBunz and mother of the modern cloth diaper, agrees. “To solve this knowledge gap, we need conscientious parents to take an active role in learning about their diapering options and finding what truly works best for them by taking into account cost, health of baby, convenience and style. Cloth diapers have come a long way and are nothing like the diapers of yesteryear,” she says.